The Tex Files - Home of Arianne 'Tex' Thompson: Medicine For the Dead - Cover Reveal! 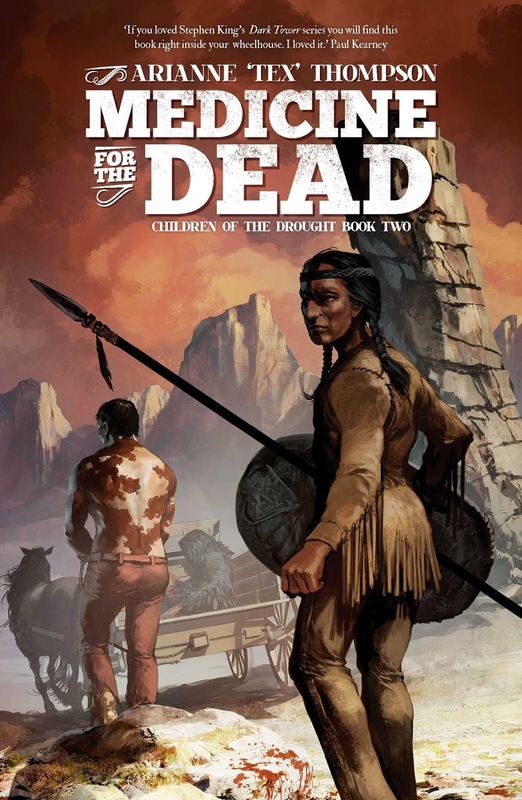 Medicine For the Dead - Cover Reveal! All right, you guys. We've done "ludicrously excited." We've done "ecstatically exhausted." We've even done "unexpectedly sad." Now it's time to set your dial for impending awesomesauce, because Medicine for the Dead, the sequel to One Night in Sixes, now has a cover, a blurb, and a date. cover by the devastatingly talented Tomasz Jedruszek! "My face!" I hear you cry. "Damn you, Tex, you've rocked my face off again!" Well, re-stick your kisser and limber up your left-click, because Medicine for the Dead is coming out on March 31st. You know what to do. "March?" you may say. "What am I supposed to do until March?!" Melissa Lenhardt's Author Q&A - and yes, I DO have a superhero alter ego, and no, it has nothing to do with fried haggis! The North Lake College News-Register - because I don't know if you know this, but NLC raised me up from a tiny Texan sproglet into the planet-smashing success I am today. Go for the article! Stay for the secret writing tips, and my not-so-subtle love-on for the community college lifestyle! In seriousness, though - you know, maybe I will get to be a big somebody someday (planet-smashing or otherwise). Maybe someday putting out a book will be business as usual, and reviews will come pouring in, and I'll have people @-replying me so hard and fast that I won't hardly be able to keep track of them, much less stop to answer them all. But right now, today, I'm still small and new - and that's its own kind of wonderful, because it means that I can see, notice, and appreciate every little thing y'all do to light up my life. At this stage of the game, every book-photo you post is a joy. Every "it was awesome!!" tweet is a delight. Every review is a milestone. Thank you guys - ALL you guys - for sharing me and my fictional friends with the rest of your world. I am so excited to add to it! Don't be too hasty. I can get you better revenge. This one has already killed one of their most valuable men, and these two have been fooled into taking him home to Atali'Krah. Sell our goods, but let us go on our way: we will take him to infect the children of Marhuk in their own home, and begin a new plague. Squee!! Gorgeous title, great cover. Congrats, m'dear! Aw, thanks, ma'am - Annie-squee is like the purest, most concentrated form of enthusiasm there is! DANG! I KNEW we should have released these things as page-a-day calendars - what were we thinking?! Ha ha ..."Aw, just look at Vuchak - what a cheerful ray of sunshine he is!" ... you crack me up. Vuchak looks like a diminutive version of Will Sampson. And that's poor Ax pullin' the rig, ain't it? Blood! Rocks! Shirtless Elim! Cow spots! This cover has it all! Great reveal, ma'am—yer cover artist does topnotch work. Oh my God, he DOES. DAMN you, linear time-stream - you destroy my perfect movie-castings before I can even fantasize about them! Well, good thing Tomek and his digital paintbrush are here to recreate indigenous perfection (and all the rest!) I've said it before, but it bears repeating: I have an AMAZING group of amazingly talented people - and I am so endlessly delighted to have you in it! Thanks, dude - I've been falling completely off the map this week, but the feeling is totally, TOTALLY mutual! Sigh. I'm worried enough about Elim now. Your Words. Let Me Help You Love Them.